Last fall we had him ridden in the pens at the Zapata with another horse and rider; just moving up and down the alleyways. Then I started working him again a few weeks ago...and he bucked me off. I don't have the time to get on him every day or so until it's time to put the miles on this summer, so I asked my friend's husband, Tom, if he would get on a him a few times a week. The first day he bitted him up he didn't know Ringo had never worked off a bit before - and thought he was a piece of work for about 20 minutes, but after he 'reminded' him he said he did really, really well. When I told him that he'd never worked off a bit, just held it in his mouth - he was all surprised and said he did way better then he had thought. 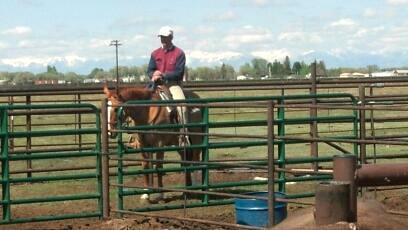 Then he rode him again for about a half hour a few days later and he did real good in the pens and alleys.